A little while ago when it was quite chilly and there was still snow, my boyfriend and I did a little trip to Berchtesgadener Land. 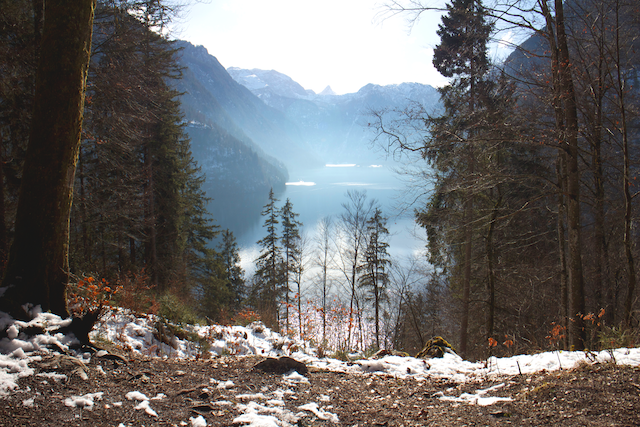 I know that we are almost in spring but if you are still in the mood for a beautiful snowy landscape then join me on this walk to the magical Königssee. We parked our car at the station of the Mount Jenner and from there it was a good 40 minutes walk until we reached the idyllic sight of the Königssee. We sat on a little bench and gazed in wonder at the beautiful landscape and enjoyed the unique and imposing atmosphere. Isn’t the view just breathtakingly beautiful? And soaked up as much sun as possible! Great pictures! What a view! Next time I am in Munich I will definitely go to Königsee! the landscape looks like in a fairytale. Almost no tourists and heavenly quiet.